Montréal became a distinct political entity when it was incorporated on March 31, 1831. On April 12, 1832, William IV of England sanctioned the new act. That same day, the cities of Québec and Toronto were also granted the same privilege. That first charter contained 24 sections that defined the powers, duties and functions of the city. The corporation was responsible for public services such as lighting, waterworks, road projects, health. It was empowered to adopt fire prevention by-laws, levy certain taxes to finance local improvement work, take out loans, acquire property and carry out expropriations to build new streets, spaces and public places. The city was divided up into eight districts, each one being required to elect two council representatives. The mayor was chosen at the first councillors’ meeting after the election. 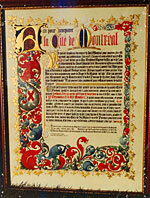 The first poll in the history of Montréal was held on the day the charter came into effect, namely June 3, 1833. Only men twenty and over, who owned real estate and had resided in the city for twelve months, were entitled to elect representatives. In total, fewer than 1300 held the property qualification, barely 20% of the adult male population. Except for Sainte-Anne Ward, where four candidates ran as councillors, all the others were elected unopposed.